Hi here is the image I sometimes get when loading Scite 3.0.06.01. Ref to the above, I now get this all the time. Seems that I might be alone, no answer yet? I am the author of the two above messages. I was tired of getting this message, so I decided to re-install Scite. I am the administrator of this PC. Scite gets installed in Program Files (x86)/AutoHotkey/SciTE. I am using the latest as indicated in Post 88 above. I spent all day yesterday to fix this with no avail. The only thing I did not touch is AutoHotkey. My old scripts are all at this time, my only issue is that I can NOT edit them using Scite witch I really appreciated. I am using "SciTE4AHK300601_Install.exe" for the install. It looks like for some reason, SciTE4AutoHotkey's toolbar is failing to load. Could you give me some information about your system, such as OS version (32/64-bit) and AHK version? Also, by any chance are you using any commercial antivirus software (i.e. not Windows Defender)? In the mean time (if you haven't already done so), try completely uninstalling SciTE4AutoHotkey with the uninstaller program (including deleting your S4AHK settings folder), then reinstalling a clean copy of it. I am with Windows 10 on a 64 bit sytem. As far antivirus I have F-Secure and Windows Defender. I will try the uninstaller that I have found in my Users/Documents/S4AHK folder. Ed: The uninstaller there is called OldBetaUninstaller.ahk I guess that is not the one. Can you tell me where to find the Uninstaller. I was using Control Panel to uninstalle it. Just tried to Uninstall with Control Panel and re-install with antivirus disabled with the same results. Anxiouly waiting for your advice. The uninstaller is the program you ran from the control panel. Could you check if the following registry keys exist? 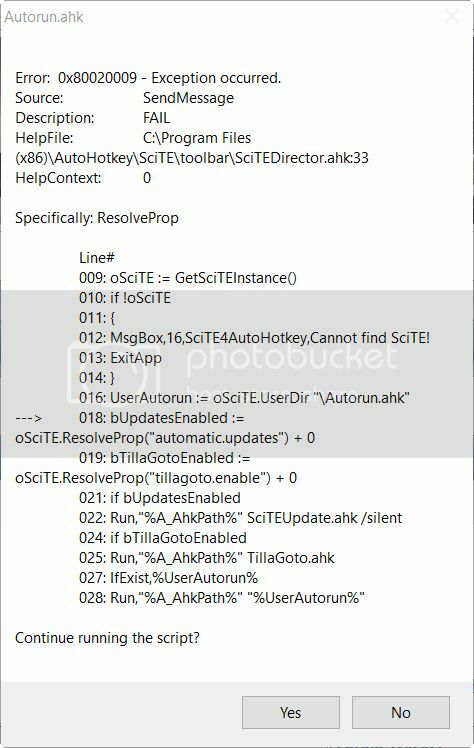 Also, when you start up SciTE4AutoHotkey, is there a process named "InternalAHK.exe", with the command line "<SciTE dir>\InternalAHK.exe" "<SciTE dir>\toolbar\Toolbar.ahk" <somenumber> <anothernumber>? Also try launching S4AHK with F-Secure fully disabled too. Thanks for your help fincs. 1 - To answer your question about the registry keys. Yes all of them exists. Using Registry Editor. is AHK Unicode 32 bit and AHK Unicode 64 bit. 3 - The above results have been captured while sc4ahk has been launched with F-Secure fully disabled. Standing by for further investigations. I think I might have misunderstood you on your second question. check it via the consol cmd provided. Which I just did, and the Dos answer is "The system cannot find the path specified." a popup offers me to create a sample script in the My Documents Folder. When I try to execute Toolbar.ahk I get an error saying "This script cannot be run independently"
In Task Manager, select the 'Details' tab as opposed to the 'Processes' tab. If you don't see any tabs at all, click on "More details" first. Command line information normally doesn't appear in the process list unless you right click on the tab header, select 'Select columns', then check "Command line" in the dialog box. When SciTE4AutoHotkey boots successfully, there should be both a SciTE.exe process and at least one InternalAHK.exe process with a command line resembling the one in my previous post. (There may be two if TillaGoto also starts up.) Also, you should not attempt to run neither InternalAHK.exe not Toolbar.ahk directly. I have checked as per above, and I have two InternalAHK.exe Processes. I also have a Scite.exe Process. No TillaGoto process per say, except for the command line pointing to it, referenced above. It is working sort of normally now. But I am not really sure if what I did had anything to do to correct it. I could explain if you want. Could you please advise, to what would be the BEST procedures to, when any problem arises, properly uninstall and re-install S4AHK? I have tried many times but I always had problem. If you kill all running internalahk.exe processes and then start scite, does it work? If so, when you boot up your pc, is internalahk.exe already running? I tried downloading your zip with the updated build that includes DebugVars but can't get it to work. I've installed S4AHK freshly and unzipped the files from your site, and then copied them into the SciTE installation folder. The application will not open now. Any ideas as to what I'm doing wrong? Yes that seemed to work. Thanks! Works fine for me, did you restart SciTE? Yeah, but I'll try again. Suppose I had some other setting in that file with bad syntax or something that was keeping it from functioning. Will try some things and get back. Nah, still can't get it to work. Below is my whole SciTEUser.properties file. Would like to try to figure out auto closing of braces and quotes too. And I can not get breakpoints to function either. # You are encouraged to edit this file! Make sure there are no spaces or tabs!